This edited article about American heroism originally appeared in Look and Learn issue number 656 published on 10 August 1974. Thanksgiving day, 1876 was bitterly cold. Snow covered Montana in huge drifts and ice already clogged smaller rivers. A tough winter lay ahead. “B” Company, 29th United States Infantry had been stationed at Fort Flint following the disastrous defeat of Custer’s 7th Cavalry by the Sioux and Cheyenne. Most of the men were seasoned Indian fighters but one had yet to fire a shot in anger. Telegraph operator Private Dennis Hogan had never wanted to be a soldier. He arrived in St. Louis looking for work on the railroad but found every job taken. Desperate, he enlisted and after basic training was posted to Fort Flint. Now, after a good dinner, he sat in his dingy little office in headquarters building, the instruments silent. At four o’clock that afternoon, the sounder tapped out a message which sent Hogan rushing to Colonel Clarke, his commanding officer. By midnight, the telegraph wires buzzed. Clarke’s troops had their two-hundred rounds per man issued and the wagons carried thirty days’ rations. At dawn, they would proceed to the junction of the forks of the Rosebud, and dig in to intercept the “hostiles.” Wherry promised two regiments from Canadian border posts to reinforce them. Hogan could have stayed safely in the fort but his Irish blood demanded he join an anticipated fight and his request to accompany the company was granted. For some strange reason, he decided to bring along a pocket instrument and several feet of wire which telegraphers only carried when on line repair duties. Eight days later, the 29th reached their chosen positions. It had been a hard march through rugged country in the worst winter conditions. That night, as shelter trenches were being constructed, the glow of Indian camp-fires was seen in every direction. Colonel Clarke knew he was surrounded and that the reinforcements had as yet failed to keep their rendezvous. Day broke the next morning with 500 men of the 29th staring out at an encircling Indian force silhouetted against the brightening sky. A quick estimation showed the Sioux to be no less than a thousand braves all on fleet-footed ponies. 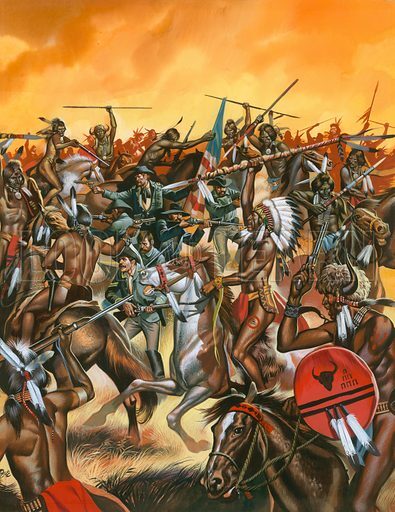 For three days the Indians attacked, decimating their enemy. Most of the wagon teams had been killed and their corpses were used as breastworks. Ammunition had begun to reach the critical stage and the men were unable to warm themselves. Fires could not be lit and even drawing water from the nearby river meant more killed or seriously wounded. Faced with an impossible situation, Colonel Clarke asked for volunteers to attempt a break-out through the Sioux lines. Shortly before three o’clock the next morning, Hogan was ready. The horse had his hoofs padded. The vital instrument hung from Hogan’s neck on coils of wire so that in an emergency he would not be delayed looking for it in a saddle bag. He had his loaded revolver and four spare rounds of ammunition. Carefully, Hogan rode the magnificent Kentuckian horse down a ravine, into a stream. Although the water was icy cold, horse and man survived. Just when it seemed that the telegrapher had made it, an Indian appeared ahead of him. Hogan managed to draw fast and killed the warrior, but the noise of the single shot aroused an alarm. Digging spurs deep into the horse’s flanks, the reluctant soldier took off . . . pursued by yelling, firing Sioux. On, and on, he sped returning fire only when he felt it necessary to slow down the pursuit. Suddenly; Hogan lurched in the saddle. A stinging pain in his shoulder almost unseated him but an instinctive left-handed grasp of the pommel kept him from pitching headlong to the ground. Snow started falling and the Sioux fell behind, lost in the blizzard. Patting his mount’s neck, Hogan felt the warmth of blood oozing from his wound. Slowing a little, he attempted to reload his revolver a second time and discovered he had only one bullet left. Less than a mile from the telegraph line, he chanced to glance back. The snow had tapered off a bit. A lone Indian came into sight. A rifle cracked and the bullet screamed past Dennis’s head. Once again, the flash of a muzzle spurted against the dead white of snow-blanketed horizons. “It’s you or me, bhoyo,” Dennis thought and vaulted from the saddle, flinging himself flat on the ground. Using his injured right arm as a rest he aimed and squeezed off his last shot. The redskin slammed backwards off his pony and lay motionless. Nothing could stop Hogan sending his message now. Loss of blood and the intense cold had weakened him. He could not remount and so he staggered on, the horse obediently trailing in his rear. When he reached the wire, another problem faced him. He did not have the strength to pull down the lance-like pole stringing the telegraph line. Sixteen feet separated him from his mission. Desperate, he sank to the ground and heard his mount snort. His eyes lifted and he saw the lariat attached to the saddle horn. With the lariat tied to the lance and secured to the horn, Hogan slapped the horse’s rump and heard the sharp crack of wood breaking. Making his connection, he got his pocket instrument ready and began to tap out a message . . . Left-handedly. Falteringly . . . Frozen fingers doing their best to operate the key. The operator in Fort Scott barely heard the weak signal. The shaky, indistinct efforts of an amateur, he reckoned. But he took down the message . . . The sounder suddenly went silent. When Colonel Foster’s troops reached the 29th they found Clarke wounded, most of his senior officers dead and the commander clinging to life by a thread called hope. “Hogan? Who is Hogan?” Colonel Foster asked. “The man who struggled through the Sioux lines and got word to you,” Clarke said, feeble from his wound. Pushing their mounts, the squad covered the twenty-five miles in double-quick time. And found Dennis Hogan. His left hand still grasped the pocket instrument, with the key still open, a bullet hole in his head. And a Sioux brave clasping a scalping knife in his hand lay a few feet away. Reconstruction of Hogan’s feat filled in the story. The Indian had not been killed by Hogan’s last shot. Mortally wounded, he had crawled forward as Dennis tapped out his message. He had slain his enemy but failed to take the scalp that his tribe demanded from a victorious warrior. With due ceremony, the survivors of the 29th buried their hero, where he had died. And, later, a simple stone was erected . . .